International cotton prices moved in a fairly volatile fashion throughout September, though without departing from their previous trading range. Fluctuations were at times related to weather events which threatened to disturb the outlook for market fundamentals, whereas the movement of futures prices in New York was mainly attributed to speculative influences. Open interest, which traditionally signals an increased potential for volatility, remained particularly heavy. China’s Zhengzhou futures market has also at times moved erratically, imparting further volatility to prices. 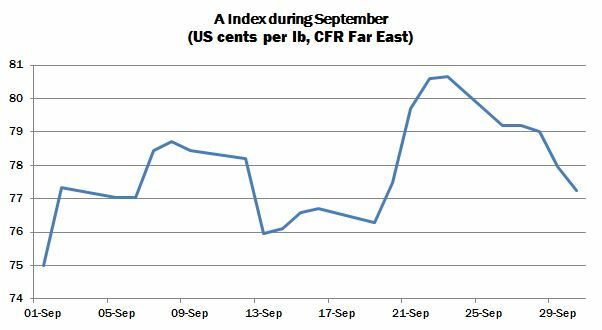 The Cotlook A Index opened at its lowest point of the period and ended some two cents higher than that level, having traded during the month in a range of almost six US cents per lb. Providing some upward impetus to prices was persistent mill demand, which remained focused primarily on remnant cotton available from the 2015/16 crops for nearby delivery. The depletion of such supplies meant that trade sellers on occasion difficulty in meeting spinners’ requirements. West African and Australian had for some time been virtually exhausted. Brazilian cotton was quite well committed in the near-term despite high raw replacement costs, and the potential for securing lots from that origin for October shipment became increasingly limited. The persistent competitiveness of US cotton in relation to other growths, which since the start of the current season has been reflected in strong export reports, was well maintained. The reports released during September displayed weekly net increases to commitments in the range of 340,000 running bales to 92,000. By the week ended September 22, cumulative commitments stood some 2.1 million bales ahead of the same date in the previous year. 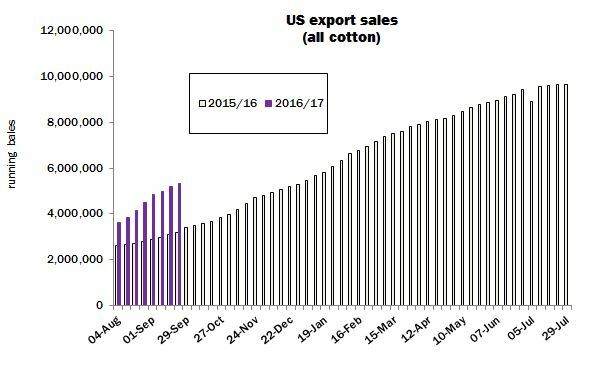 The near-term supply of US cotton therefore appears well committed. USDA’s current estimate of US exports in 2016/17, pitched at 11.5 million bales (480 lbs), around 2.35 million bales ahead of last season, appears less ambitious than had been considered when advanced in July. According to the Department’s September supply and demand estimates, however, attainment of the export projection would not prevent an increase in the end-of-season carryover, by 1.1 million bales, to 4.9 million, which would be the highest ending stock since the 2008/09 season. September saw crops in several parts of the Northern Hemisphere approach maturity and harvesting commence in a number of producing countries. Few major setbacks were reported during the period, and occasional adverse weather developments appeared more likely to affect quality than the size of crops. The broadly optimistic production outlook tended to instil caution in some mill buyers, who anticipated that harvest pressures might exert downward pressure on international offering rates. In this connection, developments in India remained under close attention. The extent to which the harvest in that origin will weigh on international prices will command close attention, and though new crop had begun to arrive in gin yards during September, at the time of writing no considerable downturn had yet been perceived. Some observers posited that the initial level of demand which Indian cotton will presumably experience once at market could limit any price decline, at least in the short term. However, India’s output is expected to be higher than in 2015/16, by Cotlook’s estimate, owing to improved yields. While spinners remained generally fairly cautious buyers, further trade purchasing of new crop cotton was witnessed. A good volume of forward buying from first hands, particularly of Australian and West African 2017 crop, was already in evidence and CIS also attracted some buying interest. Perhaps 80 percent of the African Franc Zone crop, and a good portion of potential Australian output, are committed from growers’ hands. The situation in China has remained somewhat removed from the behaviour of the world market, given the continued restriction of raw cotton imports and the underlying bullish sentiment on the domestic market, which has been exacerbated by an already tight supply situation and the expectation of a delayed crop in Xinjiang. Catalogues at the state reserve auction series, which concluded at the end of the month, continued to sell out in many sessions and the cumulative total volume disposed of amounted to over 2.6 million tonnes, leaving approximately 8.5 million, a still massive volume, in government hands. 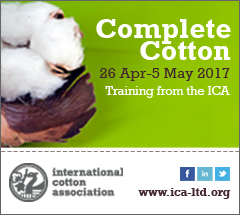 Cotton Outlook’s assessment of Chinese consumption in the 2016/17 season underwent a further increase, of 350,000 tonnes, following a significant upward adjustment in our August assessment. Consumption is now placed at 7.55 million tonnes, owing in part to the persistently strong performance of state reserves, but also to a further realisation that mill use had previously been significantly understated. It is presumed that state reserve auctions will be resumed in 2017, foreshadowing further inroads being made into Chinese stocks. China’s full reintegration to the world market, however, may take longer, and will of course depend on the speed of stock depletion and subsequent relaxation of import controls over the next few seasons. In the meantime, it seems like that world prices will be more heavily influenced by the balance of supply and demand in the rest of the world. The biggest change to Cotlook’s production figures during September concerned Australia, where optimism has been growing with regard to potential output, as a result of abundant rainfall over the past several weeks. Our figure for 2016/17 has been increased to 900,000 tonnes (roughly 4 million local bales) during the period, and some private estimates are yet higher. US production has also been raised, to 3.48 million tonnes, in line with USDA estimates. A good growing season has boosted yield prospects, particularly in the important West Texas growing region, and a year-on-year increase is in prospect of around 25 percent. In addition to the major revision for China, a number of smaller adjustments were made to our assessment of consumption in various markets, including Bangladesh, where the continuation of good export growth was noted in the ready-made garment industry. 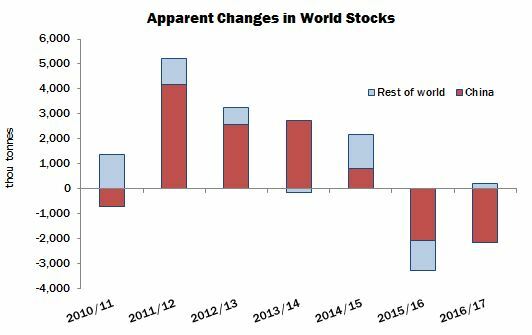 Our forecast change in world stock levels therefore implies a greater reduction than previously, of just under 2 million tonnes (following a decline of over three million in 2015/16), though the downturn remains entirely the result of figures for China, where a contraction of 2,160,000 tonnes is anticipated. In the rest of the world, stock levels are expected to rise by a relatively modest 189,000 tonnes, lower than the 224,000 put forward in our last contribution.